Jess McCall, associate English professor at Delaware Valley University, plays the steel drums during rehearsal for the band "Jess and the Mansplainers," which she formed with three other faculty members. 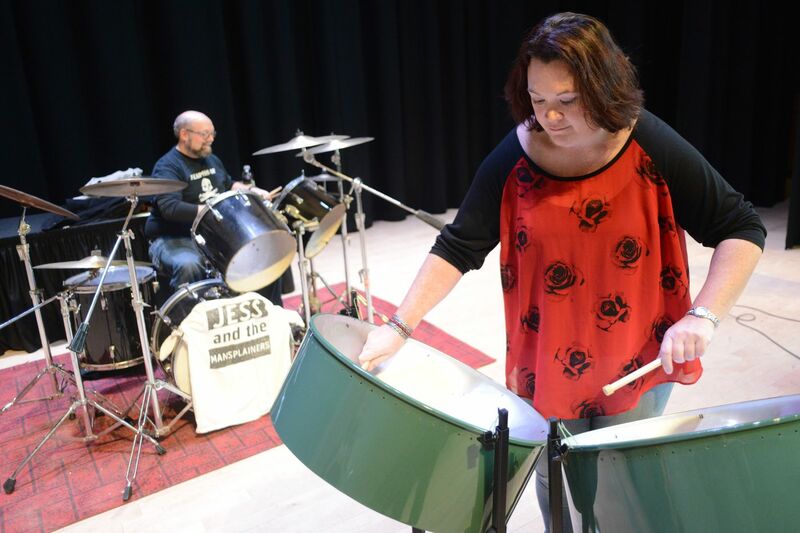 Meet Jess McCall, a professor at Delaware Valley University, whose specialties include Shakespeare, superheroes, and rocking on the steel drums with her band, Jess and the Mansplainers. When Jess McCall was a little girl, her brother took her to the comic book store in their small Illinois town. “Are there any girls?” she asked him. “Yeah, there’s Storm in the X-Men,” he said, and she bought all the X-Men comics she could. Today, McCall — an associate professor of English at Delaware Valley University in Doylestown — counts comic books, female representation in the superhero genre, and Shakespeare among her studies. McCall also heads up a steel-drum-led band of college professors called Jess and the Mansplainers. The Mansplainers, who are all DelVal instructors, include guitarist Craig Stutman, assistant professor of history and public policy; drummer Matt Mutchler, assistant professor of counseling psychology; and bassist David Timoney, chair of the education department. “A lot of us teach in the social justice area and touch on issues of gender. It’s something that comes up in our classes a lot," Mutchler said. So far, Jess and the Mansplainers, formed last year, has played only at DelVal functions. The band’s catalog includes just four songs: Crazy Train, Sweet Child of Mine, Axel F, and The Devil Went Down to Georgia (Jess takes the fiddle part on the steel drums). McCall began playing steel drums at Western Illinois University. After a stint working as an engineer’s assistant at a tool factory, making parts for John Deere and Caterpillar equipment, McCall went back to school to pursue teaching. She began at DelVal in 2012 and was the first instructor at the school to teach courses on women’s literature and graphic novels. She’s also member of DelVal’s wind ensemble and its jazz band, for which she plays piano. And in the summer, she plays pit for the Bucks County Gilbert and Sullivan Society. But her real passion is superheroes. She talks about how they mirror society and show us what we wish “or what we think we wish.” She makes you question whether power is illustrated by Captain America’s muscles or by the moments where he’s kind and patient. “They give us this idea that maybe we could be better than we are, that if we tried a little bit we could help each other out and come together,” she said. Jess McCall, an associate professor of English at Delaware Valley University who studies comics books, talks about female representation in the superhero genre. So why are there still so few female superheroes? McCall said that in a patriarchal society men aren’t used to viewing themselves through women characters, though girls can easily see themselves through figures like Harry Potter. She’s hopeful, though, and has seen a change coming in films like Wonder Woman and Black Panther. On Feb. 28 McCall will be part of a panel discussion following a screening of Black Panther at DelVal. He never took an art class, but Kambel Smith, who has autism, is gaining the art world’s attention for his cardboard sculptures of Philly buildings. At 94, Wynnifred Franklin works up to six days a week at her bakery job — and loves it.